"7 Colors" for the iPhone is a fan remake of the original 1991 game with the same title created by Dmitry Pashkov. You can now enjoy this beautiful and addictive game for the iPhone, too! Can you capture the field before the computer or your friend does? Start with just one tile in the corner of the field, and recolor every move, capturing more and more adjacent tiles of the same color to dominate the board. Sounds simple? Try it and see if you can beat the game. 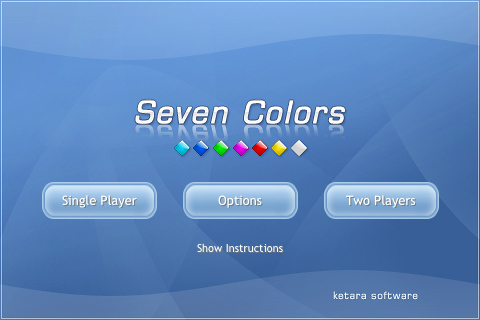 Seven Colors supports both a single-player mode against a computer and a two player mode against one of your friends (or enemies) on the same iPhone. Three levels of difficulty and three board sizes are also included for different levels of challenge. A: The goal of the game is to capture at least one-half of the field. The player who does this first wins. A: You start by owning a single tile in the bottom-left corner. 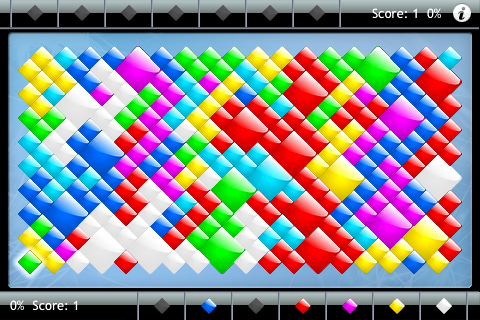 At every turn, you recolor every tile you own to a new color. Any tiles you don't own yet which are adjacent (share the sides of the tiles) to your currently owned tiles and happen to be of the same new color are appended to your territory, and will be recolored with it the next move. Q: Why are two color buttons disabled every turn? A: The disabled buttons represent two colors which you cannot choose that turn. One is your own current color, which you cannot keep, and the other is the color currently used by the second player. Q: I bought the game and it won't install on my previous-generation iPod Touch or iPhone. What do I do? A: We found that while this happens to a tiny percentage of our customers, the easiest solution is to remove the game from both the iPod/iPhone and iTunes (right-click on the game icon and choose "Delete"), and re-download it again from scratch. Note that you will not be charged a second time, since iTunes remembers all purchased applications. Then, try to install the freshly downloaded version on your iPod Touch or iPhone again. It also helps to reboot it before the second installation attempt.